In this Reacting to the Past game, the classroom is transformed into Paris in 1791. As members of the National Assembly gather to craft a constitution for a new France, students wrestle with the threat of foreign invasion, political and religious power struggles, and questions of liberty and citizenship. Reacting to the Past is an award-winning series of immersive role-playing games that actively engage students in their own learning. Students assume the roles of historical characters and practice critical thinking, primary source analysis, and argument, both written and spoken. For more information about the series, visit wwnorton.com/reacting. Jennifer Popiel is Associate Professor of History at Saint Louis University. She is the award-winning author of Rousseau's Daughters: Domesticity, Education, and Autonomy in Modern France as well as a Fulbright Research Scholar and past President of the Western Society for French History. She recently recorded From Spinning Wheel to Steam and Steel: Understanding the Age of Industrialization with Modern Scholar recorded books. As an intellectual historian of the eighteenth and nineteenth centuries, her research has explored women's history, childhood, education, and individuality in the modern world. Her current work examines French Catholics such as Rose Philippine Duchesne to investigate the intersection of vocation, spirituality, and public activism. Mark C. Carnes is professor of history at Barnard College and creator of Reacting to the Past. He is the author of many books in American history and general editor of the 26-volume American National Biography, published by the ACLS and Oxford University Press. Gary Kates is professor of history at Pomona College. 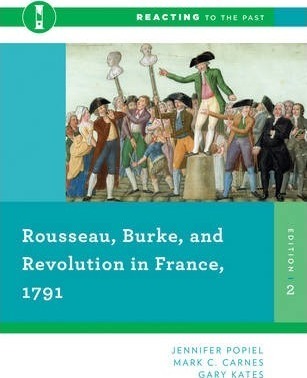 He is the author of The Cercle Social, the Girondins, and the French Revolution and the editor of The French Revolution: Recent Debates and New Controversies. He has served on the editorial board of French Historical Studies. In 1995 the Knight-Ridder News Service named his Monsieur d'Eon Is a Woman: A Tale of Sexual Masquerade and Political Intrigue as one of the top nonfiction books of that year.